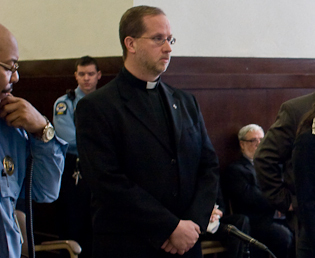 Father James Manship of St. Rosa of Lima Catholic Church in New Haven, Conn. pleaded not guilty Wednesday to charges of disorderly conduct and interfering with police. Father Manship was arrested by police in nearby East Haven after videotaping town police officers who he claims have been harassing Latino immigrants for a period of several months. 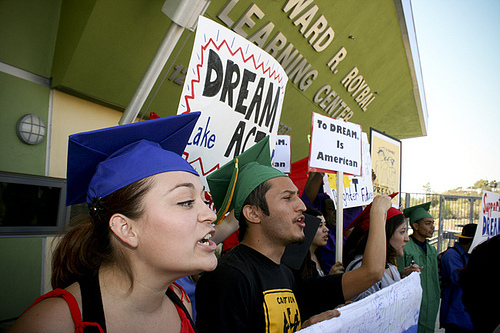 The case once again puts Connecticut at the center of the debate over the treatment of undocumented immigrants. In 2007 New Haven became the first city in the nation to offer ID cards to undocumented residents, allowing them access to municipal services. The Elm City Resident Cards have drawn sharp criticism and court challenges. In communities near New Haven, some say the hostility toward Latino immigrants goes even further. “My arrest is the tip of a toxic iceberg of racial profiling by East Haven police,” Manship told reporters at a press conference following his court hearing. On February 19th, police ordered owners of My Country Store, a Latino-owned market in East Haven, to remove license plates that they had used to decorate store windows, claiming they were inappropriately using government property. Videotape of the incident, caught by the store’s security cameras, has made its way onto YouTube and the sites of local newspapers. Three Latino store owners also spoke at the press conference, telling reporters that they had lost business because their customers were terrified of encountering police, whose cars loitered in front of the stores for no apparent reason. “We are here to ask the police for an apology,” said Pedro Gutierrez, owner of a bakery in East Haven. Feet In 2 Worlds has been reporting on St. Rosa of Lima Church for the last three weeks and has heard reports of police harassment from parishioners. 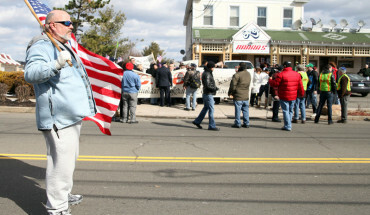 However, no related police reports have been filed by Latinos against the East Haven police. When asked about this, Manship said that the immigrants could not afford to take a day off of work or did not have the time to file a complaint. But he was also quick to stress that the problems in East Haven reflect a community and a police force that do not know how to handle the town’s changing demographics. He said that prior to the incident he had been helping members of the Latino community organize themselves to ask for a meeting with the chief of police and the town’s mayor. Manship’s arrest appears to have stalled efforts at outreach until after his court hearing. His case will be heard in court on March 27th.